"I flicked it on to Ryan, and he replied immediately, saying he’d ‘whip it up’. A couple of days later I was stunned to hear that he had not only written the music, he’d also recorded the backing track with piano, guitar, drums and bass. He suggested that I come over and learn it and record it with him. By this stage I was so excited that I nearly wet my pants." 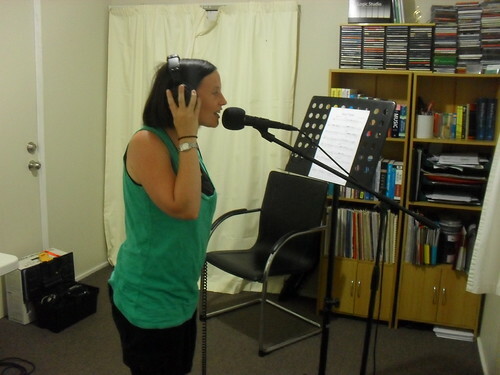 Anna came over and recorded the singing while Wendy, my wife, got clucky looking after her baby, Rosalie, upstairs. "Ryan turned up to my husband’s 30th a few days later with the complete package of CD, chords and sheet music, all professionally bound with some photos of me recording the song. My husband, for whom the song is written, is quite smitten with the song and has been humming it around the house ever since. (‘Da da da da soul food…’)"
I had heaps of fun, Anna loved it, what better way to spend a few hours!! Read her full post here.